WARNING: answering questions version 1.23 rather than the current 1.29. Client property "KeepNonPersistentTCInModelWhenClosed" of TopComponent controls behavior of winsys when TopComponent with persistence type "Never" or "OnlyOpened" is closed. As some TopComponent wants to keep their position in winsys ie. be able to reopen at the same place and some TopComponent wants to be removed from winsys model. If property is not set nonpersistent TopComponent is removed from model when closed - it is original behavior before fix of issue #101700. If property is set (to Boolean.TRUE) then TopComponent is kept in model. It means that client must explicitly set this client property to get behavior requested by issue #101700. Name of TopComponent's Boolean client property which instructs the window system to activate the given TopComponent at startup time regardless which TopComponent was active at shutdown time. So it's usuable for welcome screen-like behavior. If more than one TopComponent has this property set to Boolean.TRUE then an arbitrary one will be selected and activated. Name of client property (of Boolean type) which says whether the TopComponent is allowed to be docked anywhere (even crossing view-editor border). Name of TopComponent's Boolean client property which forces the window system to respect TopComponent's preferred size when it is slided-in from left/right/bottom sliding bar when set to Boolean.TRUE. Otherwise the slided-in TopComponent will fill the entire width/length of the IDE window (the default behavior). This switch is intended for tools/palette windows like e.g. color chooser, tool picker etc. Name of TopComponent's Boolean client property which removes close button from TopComponent's header and disables its 'Close Window' action when set to Boolean.TRUE. Name of TopComponent's Boolean client property which removes 'minimized' button from TopComponent's header and disables its 'Minimize Window' action when set to Boolean.TRUE. TopComponents which are already slided-out and have this property set to Boolean.TRUE will have 'pin' button removed from their header and their 'Minimize Window' action will be disabled. Name of TopComponent's Boolean client property which disables TopComponent's 'Undock Window' action when set to Boolean.TRUE. TopComponents which are already floating and have this property set to Boolean.TRUE will have their 'Dock Window' action disabled. Name of TopComponent's Boolean client property which disables drag and drop when set to Boolean.TRUE. Name of TopComponent's Boolean client property which disables TopComponent maximization by double-clicking its header when set to Boolean.TRUE. TopComponent's 'Maximize Window' action will be also disabled. Name of TopComponent's Boolean client property which disables 'copy' drag and drop action of a TopComponent when set to Boolean.TRUE. An Action with the property OpenIDE-Transmodal-Action set to Boolean.TRUE should function on all focused components. This includes the Main Window, dialogs, popup menus, etc. Otherwise only the Main Window and TopComponents will receive the keystroke. Name of boolean property in javax.swing.UIManager. When the property value is TRUE then the window system will turn off opacity for most of the main window components - menu bar, toolbars, status bar, sliding bars and the main desktop area component. That means that the main window background will be showing through these components. The property value must be set before the window system loads. This property was deleted and has no effect now, as sdi support was dropped and replaced by individual seperate windows. Please don't use, it's useless. Name of resource bundle property which disables the drag and drop of window TopComponents when its value is set to false, the default value is true. The property value can be adjusted by branding of org.netbeans.core.windows module. Or use -J-DNB.WinSys.TopComponent.DragAndDrop.Enabled=false command-line switch to override. Name of resource bundle property which disables undocking of window TopComponents when its value is set to false, the default value is true. When this feature is disabled then there is no 'Undock' item in TopComponent popup menu and 'Undock Window' action the main menu is disabled. The property value can be adjusted by branding of org.netbeans.core.windows module. Or use -J-DNB.WinSys.TopComponent.Undocking.Enabled=false command-line switch to override. Name of resource bundle property which disables sliding of window TopComponents when its value is set to false, the default value is true. When this feature is disabled then there is no 'Minimize Window' item in TopComponent popup menu and also the Minimize button in TopComponent's header is hidden. The property value can be adjusted by branding of org.netbeans.core.windows module. Or use -J-DNB.WinSys.TopComponent.Sliding.Enabled=false command-line switch to override. Name of resource bundle property which disables resizing of window TopComponents when its value is set to false, the default value is true. When this feature is disabled then it is not possible to drag splitter bars to change the size of TopComponents. The property value can be adjusted by branding of org.netbeans.core.windows module. Or use -J-DNB.WinSys.TopComponent.Resizing.Enabled=false command-line switch to override. Name of resource bundle property which disables closing of view TopComponents (non-editor windows) when its value is set to false, the default value is true. When this feature is disabled then there is no 'Close Window' item in view's popup menu, there is no close button in TopComponent's header and also 'Close Window' action in the main menu is disabled when a view TopComponent is activated. The property value can be adjusted by branding of org.netbeans.core.windows module. Or use -J-DNB.WinSys.View.TopComponent.Closing.Enabled=false command-line switch to override. Name of resource bundle property which disables closing of editor TopComponents (document windows) when its value is set to false, the default value is true. When this feature is disabled then there are no 'Close Window', 'Close All Documents' and 'Close Other Documents' items in editor's popup menu, there is no close button in editor's header and also Close actions in the main menu are disabled when an editor TopComponent is activated. The property value can be adjusted by branding of org.netbeans.core.windows module. Or use -J-DNB.WinSys.Editor.TopComponent.Closing.Enabled=false command-line switch to override. Name of resource bundle property which disables maximization of TopComponents when its value is set to false, the default value is true. When this feature is disabled then there is no 'Maximize Window' item in TopComponent's popup menu and also 'Maximize Window' action in the main menu is disabled. The property value can be adjusted by branding of org.netbeans.core.windows module. Or use -J-DNB.WinSys.TopComponent.Maximization.Enabled=false command-line switch to override. Name of resource bundle property which forces splitter to ignore TopComponent minimum size when resizing when its value is set to false, the default value is true. When this feature is enabled then the splitter bars will not move beyond the minimum size of its TopComponents. The property value can be adjusted by branding of org.netbeans.core.windows module. Or use -J-DNB.WinSys.Splitter.Respect.MinimumSize.Enabled=true command-line switch to override. Name of resource bundle property which allows to drag and drop the whole group of non-document windows when its value is set to true, which is also the default value. The property value can be adjusted by branding of org.netbeans.core.windows module. Or use -J-DNB.WinSys.Mode.View.DragAndDrop.Enabled=false command-line switch to override. Name of resource bundle property which allows to drag and drop the whole group of document windows when its value is set to false, which is also the default value. The property value can be adjusted by branding of org.netbeans.core.windows module. Or use -J-DNB.WinSys.Mode.Editor.DragAndDrop.Enabled=true command-line switch to override. Name of resource bundle property which allows to float the whole group of non-document windows when its value is set to true, which is also the default value. The property value can be adjusted by branding of org.netbeans.core.windows module. Or use -J-DNB.WinSys.Mode.View.Undocking.Enabled=false command-line switch to override. Name of resource bundle property which allows to float the whole group of document windows when its value is set to false, which is also the default value. The property value can be adjusted by branding of org.netbeans.core.windows module. Or use -J-DNB.WinSys.Mode.Editor.Undocking.Enabled=true command-line switch to override. Name of resource bundle property which allows to minimize (slide-out) the whole group of non-document windows when its value is set to true, which is also the default value. The property value can be adjusted by branding of org.netbeans.core.windows module. Or use -J-DNB.WinSys.Mode.Sliding.Enabled=false command-line switch to override. Name of resource bundle property which controls the opening of windows in a minimized (slided-out) group of non-document windows. When set to true (the default value) then a window which should open in a minimized group (Mode) will open also minimized (slided-out). When set to false a window will open docked even though the whole group (Mode) has been minimized. The property value can be adjusted by branding of org.netbeans.core.windows module. Or use -J-DNB.WinSys.TopComponent.Auto.Slide.In.Minimized.Mode.Enabled=false command-line switch to override. Name of resource bundle property which allows to close the whole group of non-document windows when its value is set to true, which is also the default value. The property value can be adjusted by branding of org.netbeans.core.windows module. Or use -J-DNB.WinSys.Mode.Closing.Enabled=false command-line switch to override. Name of resource bundle property which controls whether the main IDE window may hide temporarily (true) when switching window layout role or whether the main window should stay visible when switching roles (false). The default value is false. The property value can be adjusted by branding of org.netbeans.core.windows module. Or use -J-DNB.WinSys.WinSys.Show.Hide.MainWindow.While.Switching.Role=true command-line switch to override. Name of resource bundle property which when set to true will force opening of new editor windows docked into the main IDE window. When set to false new editor windows will open tabbed with the last active editor window (which may be floating). The default value is false. The property value can be adjusted by branding of org.netbeans.core.windows module. Or use -J-DNB.WinSys.WinSys.Open.New.Editors.Docked=true command-line switch to override. Name of resource bundle property which enables/disables drag and drop of TopComponents into sliding Modes. When set to true then user can drag a TopComponent and drop it into a sliding bar to minimize it. The default value is false. The property value can be adjusted by branding of org.netbeans.core.windows module. Or use -J-DNB.WinSys.WinSys.DragAndDrop.Sliding.Enabled=true command-line switch to override. Name of resource bundle property which allows replacing the custom TabbedContainer with plain Swing JTabbedPane implementation when the property value is true. The default value is false. The property value can be adjusted by branding of org.netbeans.core.windows module. Or use -J-DNB.WinSys.WinSys.TabControl.SimpleTabs.Enabled=true command-line switch to override. Name of resource bundle property which defines the placement of window tabs. The possible values are top (default), bottom, left, right. Branding of this property has no effect when WinSys.TabControl.SimpleTabs.Enabled is set to false. The property value can be adjusted by branding of org.netbeans.core.windows module. Name of resource bundle property which defines the tab layout when JTabbedPane implementation of tab control is being used. When set to true window tabs will be organized into multiple rows, when set to false the tab displayer will have scroll buttons. Branding of this property has no effect when WinSys.TabControl.SimpleTabs.Enabled is set to false. The property value can be adjusted by branding of org.netbeans.core.windows module. Name of resource bundle property which can disable window switching when the input focus is in JTable or JTabbedPane. Ctrl+Tab and Ctrl+Shift+Tab key strokes are hard-coded to switch between opened TopComponents. However the same keys are also used in some Containers (e.g. JTable and JTabbedPane) to transfer input focus to next Component. When this property is set to true (default value) and input focus is in JTable or JTabbedPane then the window system will consume Ctrl+Tab and Ctrl+Shift+Tab key strokes and show window switcher popup. When this property is set to false then KeyboardFocusManager will consume Ctrl+Tab and Ctrl+Shift+Tab key strokes to transfer focus out of JTable or out of JTabbedPane. The property value can be adjusted by branding of org.netbeans.core.windows module. Or use -J-DNB.WinSys.WinSys.CtrlTabSwitching.In.JTable.Enabled=true command-line switch to override. Custom border management for tabbed containers can be achieved by implementing interface org.netbeans.core.windows.view.ui.tabcontrol.BorderProvider and putting instance into Swing's UIManager table under key with the same name as interface has. Usage example: Provide BorderProviderImpl implementation and put it in table javax.swing.UIManager.put("org.netbeans.core.windows.view.ui.tabcontrol.BorderProvider", borderProviderImpl) during startup, before main window is shown. Answer: Window System API is used to display and control application GUI: Main window, frames, components. 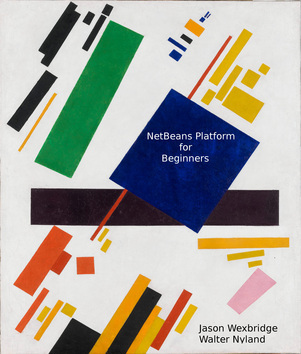 For general overview of the concepts, together with code samples, see chapter 6, of NetBeans Platform for Beginners by Jason Wexbridge and Walter Nyland. General usecases can be read in the design document created before work on new window system design started. How to create a '.settings' file for a TopComponent? Either write it by hand (not that hard if you copy other file and tweak it to match your TC), or start the IDE, instantiate the TC somehow (You have a "Window->Show My TC", right? ), copy the file that gets created in $userdir/config/Windows2Local/Component and cleanup the serialdata section - replace it with proper "<instance class='..." /> tag. How to make a TopComponentGroup? I think I do #2 in FooTopComponent.componentActivated() and #3 in FooTopComponent.componentDeactivated(). Is that right? Answer: SAX parser is used to parse settings files. Answer: 100% pure Java. Runs anywhere. Swing is used for GUI display. Answer: It runs on JRE 1.4. Answer: Module API is part of openide.jar, implementation is mostly in core-windows.jar. Module API also contains dummy implementation usable for tests. Answer: Whole openide.jar and core-windows.jar can be deployed via AU center. Answer: openide.jar and core-windows.jar needs to be in the system directory. Answer: No. Window System API contains WindowSystemAPI. Some parts of core can use semi-private API WindowSystemImplementationAPI. Answer: You might use OpenIDE-Module-Requires: org.openide.windows.WindowManager but it is not generally done. Answer: It follows JLF standard for the custom UI components provided by core implementation. Answer: Yes. Default window system layout is in module layer. Other modules can define their own winsys elements (mode, group, component) in their module layer. Answer: Module reads its own configuration from its layer and eventualy from other module layers if provided. Data have following folder structure. It contains ModuleDataStructure - Module folder structure under Windows2 directory and LocalDataStructure - Local folder structure under Windows2Local directory. Answer: Window Manager implementation (from core) registers itself and lookup is used from API part to get the instance and return as WindowManager.getDefault () and also WindowManager.componentRegistry(). gets the registered instance of TopComponent.Registry. Also there are provided implementations of DialogDisplayer.getDefault() and NodeOperation.getDefault() services. There is also provided service which implements NbTopManager.WindowSystem - org.netbeans.core.NbTopManager$WindowSystem interface, which is used in core module. It is used for starting window system (loading and show) in startup sequence and finishiing of window system (hiding and saving) during exit sequence. The reason of this is that module API is not sufficient fot window system module, since it needs to provide its loading after all module layers are loaded etc. Answer: WindowManager and TopComponent.Registry are registered. Used to find sinleton instance by singleton accessor. Answer: Yes. It removes implementation of NodeOperation.getDefault() service provided by openide-explorer module. tab_focus_fill_dark - One of colors used in own tabs UI implementation. Usage example: To get color, call javax.swing.UIManager.get("tab_focus_fill_dark") tab_focus_fill_bright - One of colors used in own tabs UI implementation. Usage example: To get color, call javax.swing.UIManager.get("tab_focus_fill_bright") tab_unsel_fill_dark - One of colors used in own tabs UI implementation. Usage example: To get color, call javax.swing.UIManager.get("tab_unsel_fill_dark") tab_unsel_fill_bright - One of colors used in own tabs UI implementation. Usage example: To get color, call javax.swing.UIManager.get("tab_unsel_fill_bright") tab_sel_fill - One of colors used in own tabs UI implementation. Usage example: To get color, call javax.swing.UIManager.get("tab_sel_fill") tab_sel_fill_bright - One of colors used in own tabs UI implementation. Usage example: To get color, call javax.swing.UIManager.get("tab_sel_fill_bright") tab_sel_fill_dark - One of colors used in own tabs UI implementation. Usage example: To get color, call javax.swing.UIManager.get("tab_sel_fill_dark") tab_border - One of colors used in own tabs UI implementation. Usage example: To get color, call javax.swing.UIManager.get("tab_border") tab_bottom_border - One of colors used in own tabs UI implementation. Usage example: To get color, call javax.swing.UIManager.get("tab_bottom_border") tab_sel_border - One of colors used in own tabs UI implementation. Usage example: To get color, call javax.swing.UIManager.get("tab_sel_border") workplace_fill - One of colors used in own tabs UI implementation. Usage example: To get color, call javax.swing.UIManager.get("workplace_fill") tab_highlight_header - One of colors used in own tabs UI implementation. Usage example: To get color, call javax.swing.UIManager.get("tab_highlight_header") tab_highlight_header_fill - One of colors used in own tabs UI implementation. Usage example: To get color, call javax.swing.UIManager.get("tab_highlight_header_fill") standard_border - One of colors used in own tabs UI implementation. Usage example: To get color, call javax.swing.UIManager.get("standard_border") org.netbeans.core.windows.view.ui.tabcontrol.BorderProvider - Custom border management for tabbed containers can be achieved by implementing interface org.netbeans.core.windows.view.ui.tabcontrol.BorderProvider and putting instance into Swing's UIManager table under key with the same name as interface has. Usage example: Provide BorderProviderImpl implementation and put it in table javax.swing.UIManager.put("org.netbeans.core.windows.view.ui.tabcontrol.BorderProvider", borderProviderImpl) during startup, before main window is shown. org.netbeans.core.windows.TopComponent.DragAndDrop.Enabled - Name of resource bundle property which disables the drag and drop of window TopComponents when its value is set to false, the default value is true. The property value can be adjusted by branding of org.netbeans.core.windows module. Or use -J-DNB.WinSys.TopComponent.DragAndDrop.Enabled=false command-line switch to override. org.netbeans.core.windows.TopComponent.Undocking.Enabled - Name of resource bundle property which disables undocking of window TopComponents when its value is set to false, the default value is true. When this feature is disabled then there is no 'Undock' item in TopComponent popup menu and 'Undock Window' action the main menu is disabled. The property value can be adjusted by branding of org.netbeans.core.windows module. Or use -J-DNB.WinSys.TopComponent.Undocking.Enabled=false command-line switch to override. org.netbeans.core.windows.TopComponent.Sliding.Enabled - Name of resource bundle property which disables sliding of window TopComponents when its value is set to false, the default value is true. When this feature is disabled then there is no 'Minimize Window' item in TopComponent popup menu and also the Minimize button in TopComponent's header is hidden. The property value can be adjusted by branding of org.netbeans.core.windows module. Or use -J-DNB.WinSys.TopComponent.Sliding.Enabled=false command-line switch to override. org.netbeans.core.windows.TopComponent.Resizing.Enabled - Name of resource bundle property which disables resizing of window TopComponents when its value is set to false, the default value is true. When this feature is disabled then it is not possible to drag splitter bars to change the size of TopComponents. The property value can be adjusted by branding of org.netbeans.core.windows module. Or use -J-DNB.WinSys.TopComponent.Resizing.Enabled=false command-line switch to override. org.netbeans.core.windows.View.TopComponent.Closing.Enabled - Name of resource bundle property which disables closing of view TopComponents (non-editor windows) when its value is set to false, the default value is true. When this feature is disabled then there is no 'Close Window' item in view's popup menu, there is no close button in TopComponent's header and also 'Close Window' action in the main menu is disabled when a view TopComponent is activated. The property value can be adjusted by branding of org.netbeans.core.windows module. Or use -J-DNB.WinSys.View.TopComponent.Closing.Enabled=false command-line switch to override. org.netbeans.core.windows.Editor.TopComponent.Closing.Enabled - Name of resource bundle property which disables closing of editor TopComponents (document windows) when its value is set to false, the default value is true. When this feature is disabled then there are no 'Close Window', 'Close All Documents' and 'Close Other Documents' items in editor's popup menu, there is no close button in editor's header and also Close actions in the main menu are disabled when an editor TopComponent is activated. The property value can be adjusted by branding of org.netbeans.core.windows module. Or use -J-DNB.WinSys.Editor.TopComponent.Closing.Enabled=false command-line switch to override. org.netbeans.core.windows.TopComponent.Maximization.Enabled - Name of resource bundle property which disables maximization of TopComponents when its value is set to false, the default value is true. When this feature is disabled then there is no 'Maximize Window' item in TopComponent's popup menu and also 'Maximize Window' action in the main menu is disabled. The property value can be adjusted by branding of org.netbeans.core.windows module. Or use -J-DNB.WinSys.TopComponent.Maximization.Enabled=false command-line switch to override. org.netbeans.core.windows.Splitter.Respect.MinimumSize.Enabled - Name of resource bundle property which forces splitter to ignore TopComponent minimum size when resizing when its value is set to false, the default value is true. When this feature is enabled then the splitter bars will not move beyond the minimum size of its TopComponents. The property value can be adjusted by branding of org.netbeans.core.windows module. Or use -J-DNB.WinSys.Splitter.Respect.MinimumSize.Enabled=true command-line switch to override. NbMainWindow.showCustomBackground - Name of boolean property in javax.swing.UIManager. When the property value is TRUE then the window system will turn off opacity for most of the main window components - menu bar, toolbars, status bar, sliding bars and the main desktop area component. That means that the main window background will be showing through these components. The property value must be set before the window system loads. org.netbeans.core.windows.Mode.View.DragAndDrop.Enabled - Name of resource bundle property which allows to drag and drop the whole group of non-document windows when its value is set to true, which is also the default value. The property value can be adjusted by branding of org.netbeans.core.windows module. Or use -J-DNB.WinSys.Mode.View.DragAndDrop.Enabled=false command-line switch to override. org.netbeans.core.windows.Mode.Editor.DragAndDrop.Enabled - Name of resource bundle property which allows to drag and drop the whole group of document windows when its value is set to false, which is also the default value. The property value can be adjusted by branding of org.netbeans.core.windows module. Or use -J-DNB.WinSys.Mode.Editor.DragAndDrop.Enabled=true command-line switch to override. org.netbeans.core.windows.Mode.View.Undocking.Enabled - Name of resource bundle property which allows to float the whole group of non-document windows when its value is set to true, which is also the default value. The property value can be adjusted by branding of org.netbeans.core.windows module. Or use -J-DNB.WinSys.Mode.View.Undocking.Enabled=false command-line switch to override. org.netbeans.core.windows.Mode.Editor.Undocking.Enabled - Name of resource bundle property which allows to float the whole group of document windows when its value is set to false, which is also the default value. The property value can be adjusted by branding of org.netbeans.core.windows module. Or use -J-DNB.WinSys.Mode.Editor.Undocking.Enabled=true command-line switch to override. org.netbeans.core.windows.Mode.Sliding.Enabled - Name of resource bundle property which allows to minimize (slide-out) the whole group of non-document windows when its value is set to true, which is also the default value. The property value can be adjusted by branding of org.netbeans.core.windows module. Or use -J-DNB.WinSys.Mode.Sliding.Enabled=false command-line switch to override. org.netbeans.core.windows.TopComponent.Auto.Slide.In.Minimized.Mode.Enabled - Name of resource bundle property which controls the opening of windows in a minimized (slided-out) group of non-document windows. When set to true (the default value) then a window which should open in a minimized group (Mode) will open also minimized (slided-out). When set to false a window will open docked even though the whole group (Mode) has been minimized. The property value can be adjusted by branding of org.netbeans.core.windows module. Or use -J-DNB.WinSys.TopComponent.Auto.Slide.In.Minimized.Mode.Enabled=false command-line switch to override. org.netbeans.core.windows.Mode.Closing.Enabled - Name of resource bundle property which allows to close the whole group of non-document windows when its value is set to true, which is also the default value. The property value can be adjusted by branding of org.netbeans.core.windows module. Or use -J-DNB.WinSys.Mode.Closing.Enabled=false command-line switch to override. WinSys.Show.Hide.MainWindow.While.Switching.Role - Name of resource bundle property which controls whether the main IDE window may hide temporarily (true) when switching window layout role or whether the main window should stay visible when switching roles (false). The default value is false. The property value can be adjusted by branding of org.netbeans.core.windows module. Or use -J-DNB.WinSys.WinSys.Show.Hide.MainWindow.While.Switching.Role=true command-line switch to override. WinSys.Open.New.Editors.Docked - Name of resource bundle property which when set to true will force opening of new editor windows docked into the main IDE window. When set to false new editor windows will open tabbed with the last active editor window (which may be floating). The default value is false. The property value can be adjusted by branding of org.netbeans.core.windows module. Or use -J-DNB.WinSys.WinSys.Open.New.Editors.Docked=true command-line switch to override. WinSys.DragAndDrop.Sliding.Enabled - Name of resource bundle property which enables/disables drag and drop of TopComponents into sliding Modes. When set to true then user can drag a TopComponent and drop it into a sliding bar to minimize it. The default value is false. The property value can be adjusted by branding of org.netbeans.core.windows module. Or use -J-DNB.WinSys.WinSys.DragAndDrop.Sliding.Enabled=true command-line switch to override. WinSys.TabControl.SimpleTabs.Enabled - Name of resource bundle property which allows replacing the custom TabbedContainer with plain Swing JTabbedPane implementation when the property value is true. The default value is false. The property value can be adjusted by branding of org.netbeans.core.windows module. Or use -J-DNB.WinSys.WinSys.TabControl.SimpleTabs.Enabled=true command-line switch to override. WinSys.TabControl.SimpleTabs.Placement - Name of resource bundle property which defines the placement of window tabs. The possible values are top (default), bottom, left, right. Branding of this property has no effect when WinSys.TabControl.SimpleTabs.Enabled is set to false. The property value can be adjusted by branding of org.netbeans.core.windows module. WinSys.TabControl.SimpleTabs.MultiRow - Name of resource bundle property which defines the tab layout when JTabbedPane implementation of tab control is being used. When set to true window tabs will be organized into multiple rows, when set to false the tab displayer will have scroll buttons. Branding of this property has no effect when WinSys.TabControl.SimpleTabs.Enabled is set to false. The property value can be adjusted by branding of org.netbeans.core.windows module. WinSys.CtrlTabSwitching.In.JTable.Enabled - Name of resource bundle property which can disable window switching when the input focus is in JTable or JTabbedPane. Answer: No. Now is the window persistence independent from projects. Answer: Module configuration is stored in XML files. Answer: Window system DnD: Module uses standard AWT DragDrop protocol. TopComponent instances are transfered. Experimental, not enabled by default. Explorer DnD: It is also possible to DnD nodes in Explorer in such case instances of Workspace, Mode and TopComponent are transfered. Answer: Module uses the same standard protocol as actions module. In case of Copy-n-Paste instances of Workspace, Mode and TopComponent are passed to clipboard. DataFlavorDnDTopComponent - DataFlavor.javaJVMLocalObjectMimeType + "; class=org.openide.windows.TopComponent"
DataFlavorDnDTopComponent.Cloneable - DataFlavor.javaJVMLocalObjectMimeType + "; class=org.openide.windows.TopComponent$Cloneable"
DataFlavorDnDTopComponentArray - DataFlavor.javaJVMLocalObjectMimeType + "; class=org.netbeans.core.windows.dnd.TopComponentDragSupport$TopComponentArray"
Answer: Yes. The window system configuration is loaded and shown the result on screen. Answer: Module configuration is saved on exit. Any sublcass of TopComponnet with slow internal responsiveness, e.g. with slow painting routines, validating, bad UI management etc. Depends on number of displayed frames, components. Currently it is linear though some part of components initialization is done only when necessary (eg. when component is in JTabbedPane it is not necessary to initialize component ui when component is not visible. Answer: Yes. Of course it is size of memory. The other limits were not set yet. Answer: It executes long running tasks at startup and exit of IDE, i.e. loading and saving of window system configurations. Answer: There cannot be enforced the performance quality of TopComponent implementation, just could be provided performance test which could indicate some specific TopComponent instance doesn't fullfil certain performance criteria.